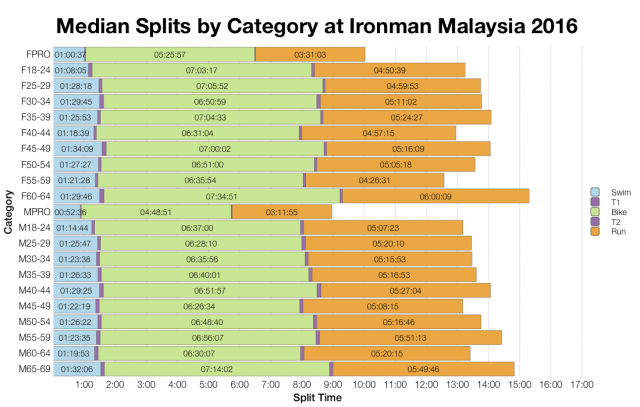 This weekend saw Ironman Malaysia take place in typically hot and humid conditions. 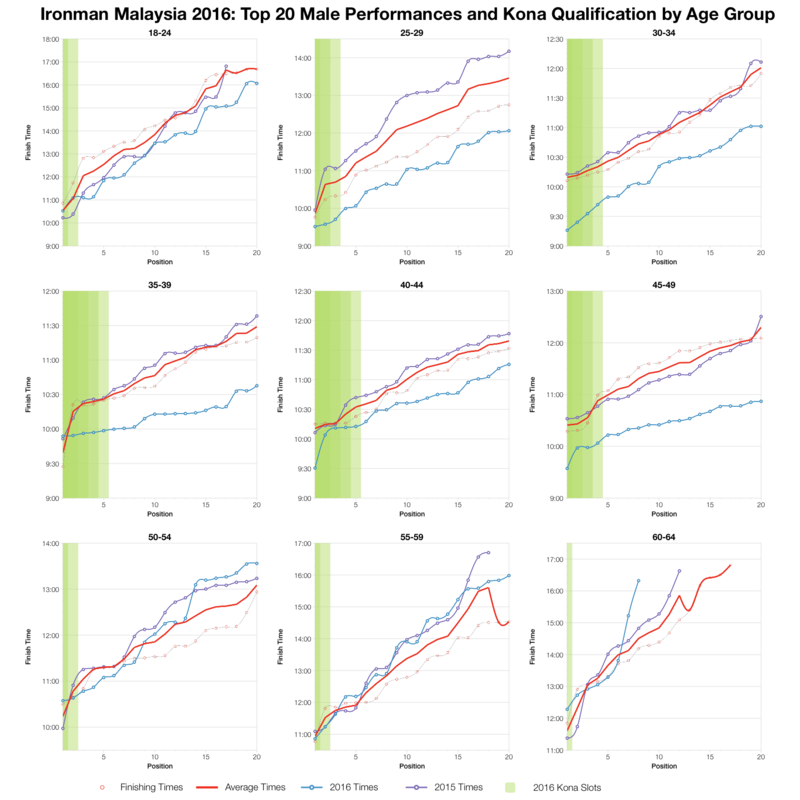 Since it’s relaunch in 2014 Malaysia has established itself as one of the tougher, slower Ironman races thanks to those conditions. If you can handle the heat there are 40 Kona slots on offer at age group athletes. The 2016 race trends faster than results from the previous two years. It’s all relative though with less than 3% of the age group field breaking the 10 hour mark this is far from a fast course. Much of this year’s apparent speed up can also be explained by a particularly slow set of results in 2015 that pull down the past averages. 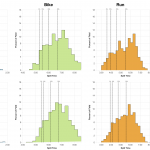 Comparing the DNF and DNS data from the three year’s of racing shows 2016 to have been the most successful so far with the lowest rates all round. This might suggest that conditions proved a little more favourable than in previous years, or perhaps competitors had a better idea of what to expect. 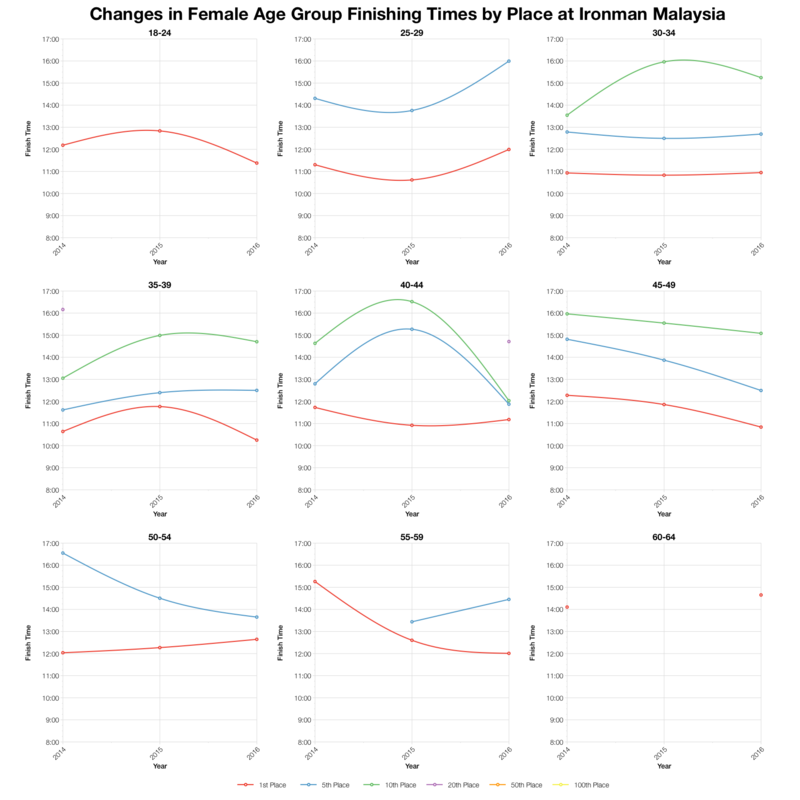 Age group medians vary, but for the most part trend faster as expected. 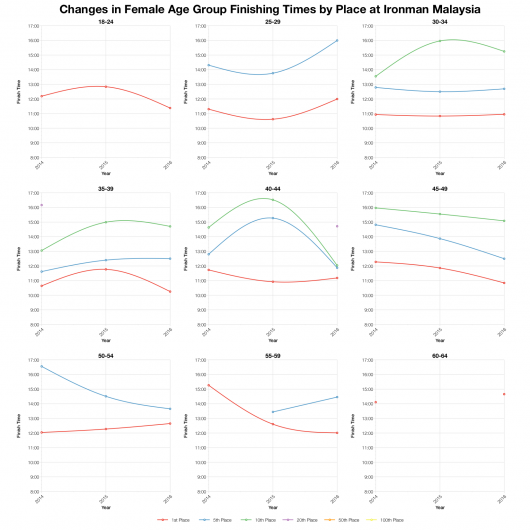 There’s more variation among female age groups where relatively small field sizes puts more weight on outlier results. 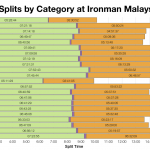 In all cases age group medians are at the slow end of what we usually see at an Ironman event. A broad spread of nations finished in automatic Kona qualifying spots (before roll down takes place), but the majority went to Australian or Japanese athletes. 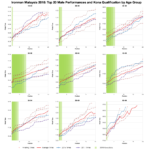 Malaysians don’t appear to have picked up any qualifying spots at least by placing. There’s also a very broad spread of nationalities racing in Malaysia. Almost a third of athletes are Malaysian, low for a hosting nation, the rest come from round the world. Tracking age group finishing times by placings over the three years of racing shows 2016 to be the fastest year yet. It does vary with division, in some instances 2014 or even 2015 were faster, but for most this year is the quickest so far. It’s also evident how the top placings in an age group show less annual variation than those back in the middle or back of pack. 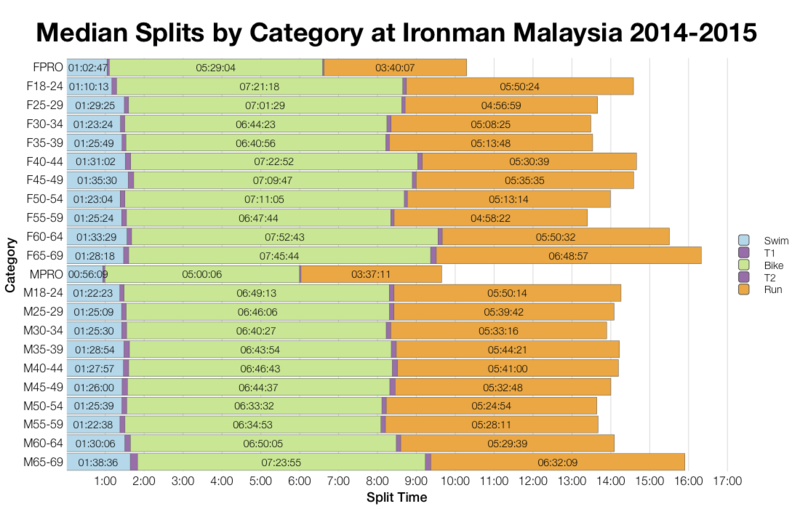 I’ve not seen the final Kona slot allocations for Malaysia so I’ve calculated the likely slot allocation based on the athlete list. From that I’ve calculated automatic qualifying times assuming there are no roll downs. 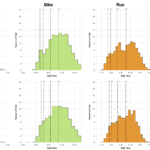 You can compare these times with other races on my Kona qualification page. 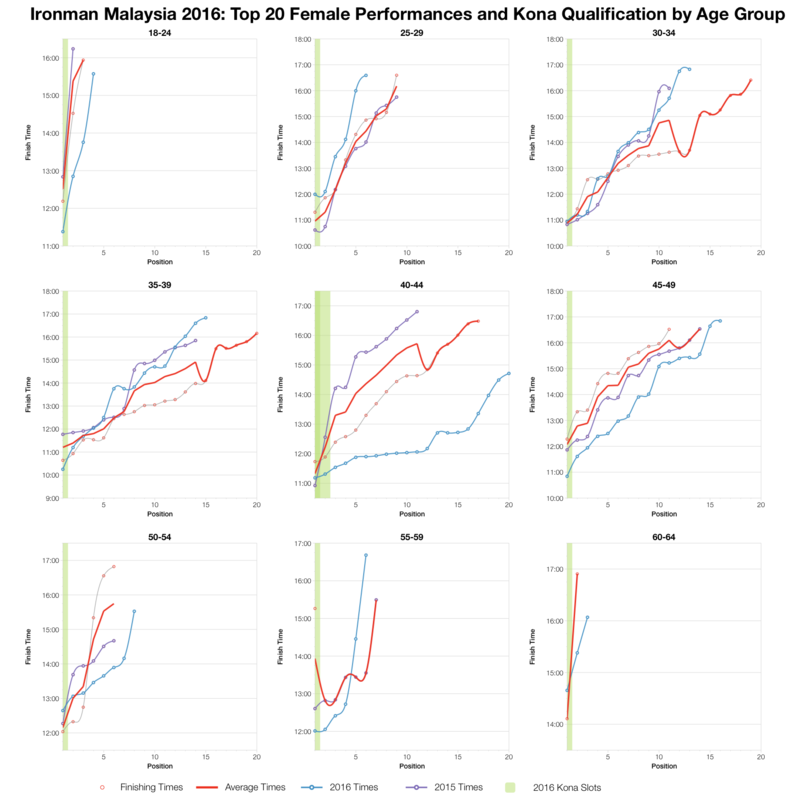 Finally, we can look at top twenty performances in each age group. 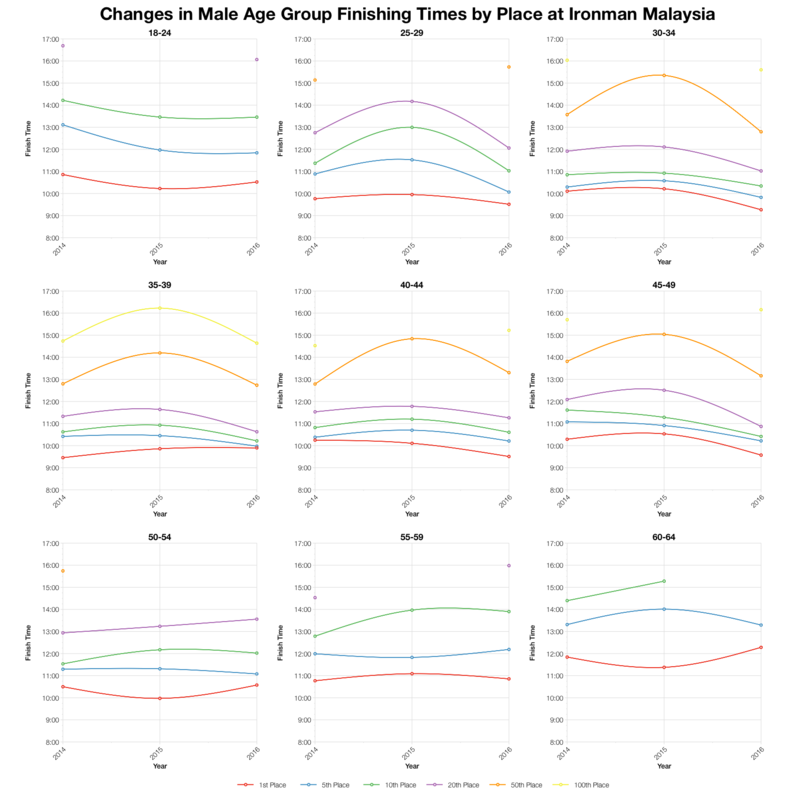 For the major, male age groups 2016 times are very clearly faster. 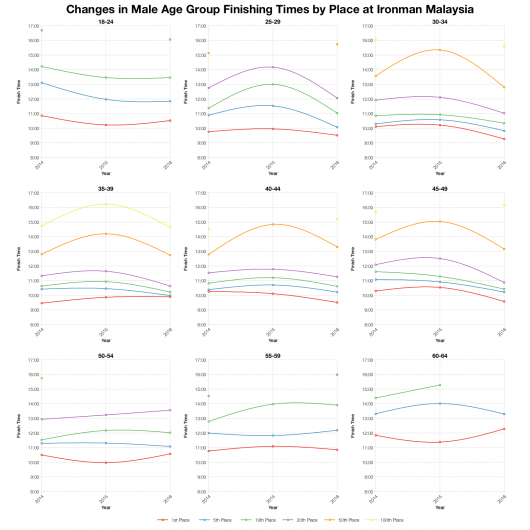 As noted before, at the very front of the age group race the differences in times are much smaller. 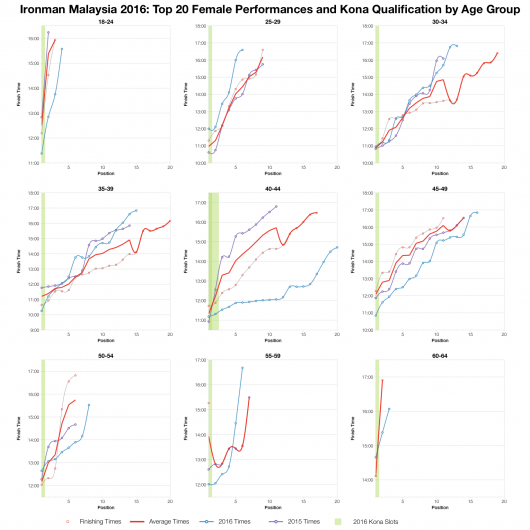 It’s often the case that variation in race conditions have a much smaller effect on the fastest age group athletes and that seems to be the case here too. While Ironman Malaysia will remain one of the slowest Ironman races on the calendar, this year appears to have been a relatively fast one for the event. You can access a spreadsheet of the full results and splits from Ironman Malaysia 2016 on my Google Drive.